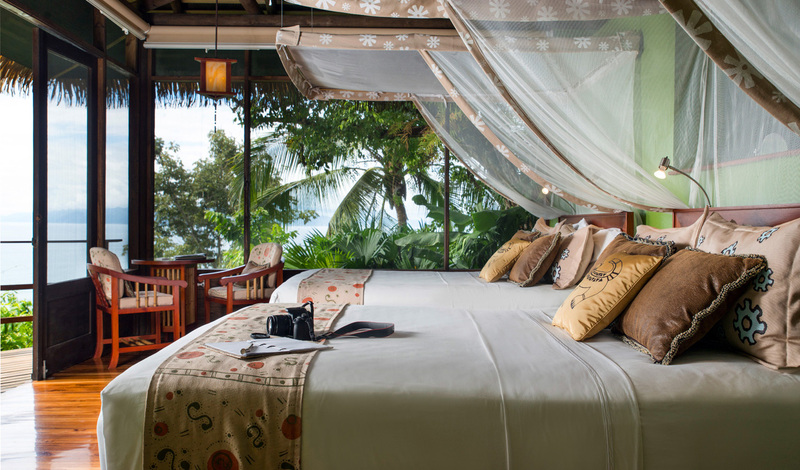 At Lapa Rios, nothing gets you as close to nature, as you awake to a chorus of tropical bird calls and watch monkeys swing from tree to tree from the comfort of your bed. Here you’ll find an idyllic retreat from modern life offering a haven of understated sustainable luxury and flawless service. Set in Central America’s last remaining lowland tropical forest, home to scarlet macaws, monkeys, and a myriad other wildlife, Lapa Rios stays true to its natural surroundings, whilst creating a romantic setting. Consisting of 17 private bungalows you can spend your days lounging by the infinity pool, surfing the Pacific swells, or taking gentle guided walking tours through the pristine rain-forest. Located at the southernmost point of the Osa Peninsula within its own pristine 1,000-acre reserve, Lapa Rios overlooks the meeting point of the Golfo Dulce fjord and turquoise waters of the Pacific Ocean. Once you arrive you will need a moment to catch your breath from the astounding ocean and jungle views laid below, where the private bungalows are strung through the lush tropical vegetation. The 17 bungalows are a perfect blend of luxe meets the great outdoors. Think open-sided, spacious gleaming hardwood and thatched-roof bungalows, decorated with comfortable four-poster beds, stylish outdoor showers and private decks, just the place for a quiet cocktail. From the comfort of your hammock, watch the passing monkeys swing by, as you pinch yourself that you are really here in the middle of this lush virgin rainforest. Where else in the world can you wake up to see humpback whales from your own private veranda? With the longest whale watching season in the world (August-October), it is more than likely you will be able to catch a glimpse of these magnificent mammals. With expert guides on hand for naturalist-led walks through the rainforest and along the beach, you can rest assured your stay won’t be lacking in incredible sights.